Another rainy day and I was itching to do something with my camera. 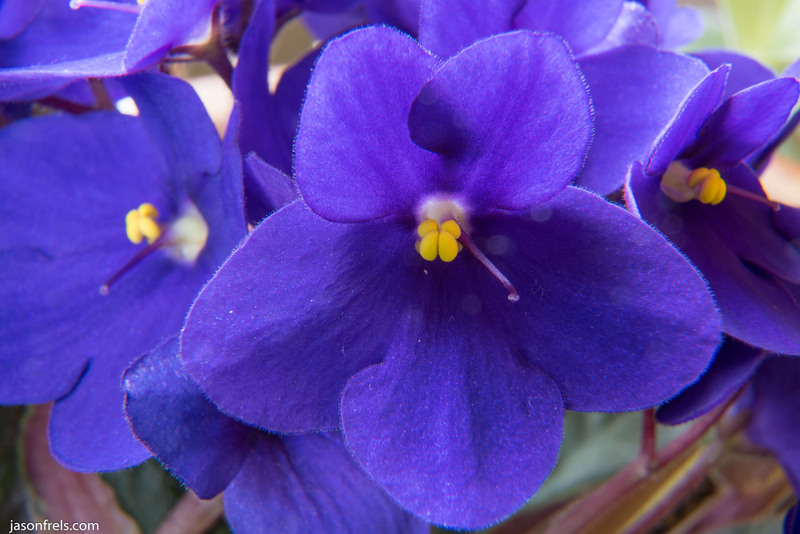 I noticed that my girlfriend’s African violets were really blooming, so I decided get the extension tubes and do some close-up pictures. 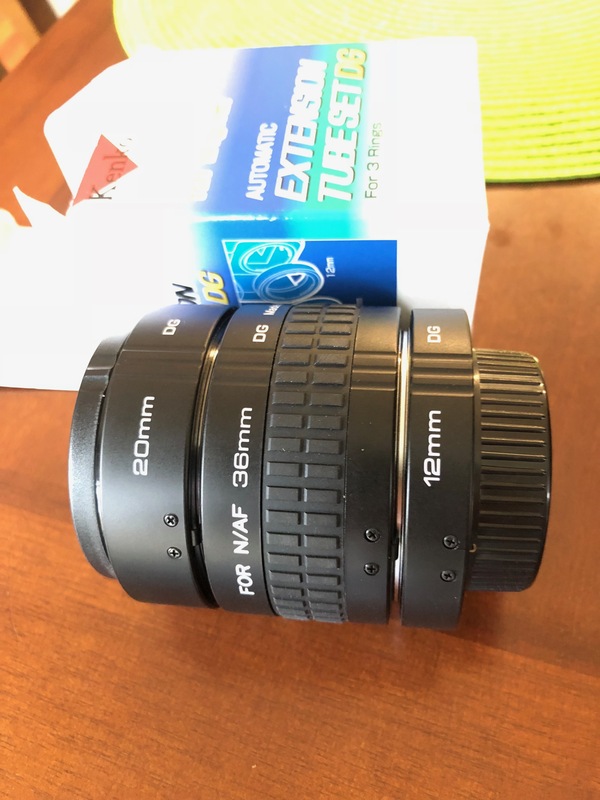 I have a set of relatively cheap extension tubes by Kenko. They are basically hollow tubes with no optical element of any kind that serve to separate your lens from your sensor. The ones I have pass the electrical signals to allow for aperture control, autofocus, etc. By moving the lens away from the camera sensor, the extension tubes allows you to focus on objects very close to your lens. A poor man’s macro lens, basically. This set has a 12mm, 20mm, and 36mm allowing you to stack them to make other lengths as well. In the below image you can see the 36mm and 20mm extension tubes stacked with my 24-120mm lens attached (shot with iPhone 8S). My 24-120 mm Nikkor lens has a specified minimum focus distance of 45cm, but with the extension tube set I can bring that down to almost 0. Below you can see that I have the lens right up in the flowers. 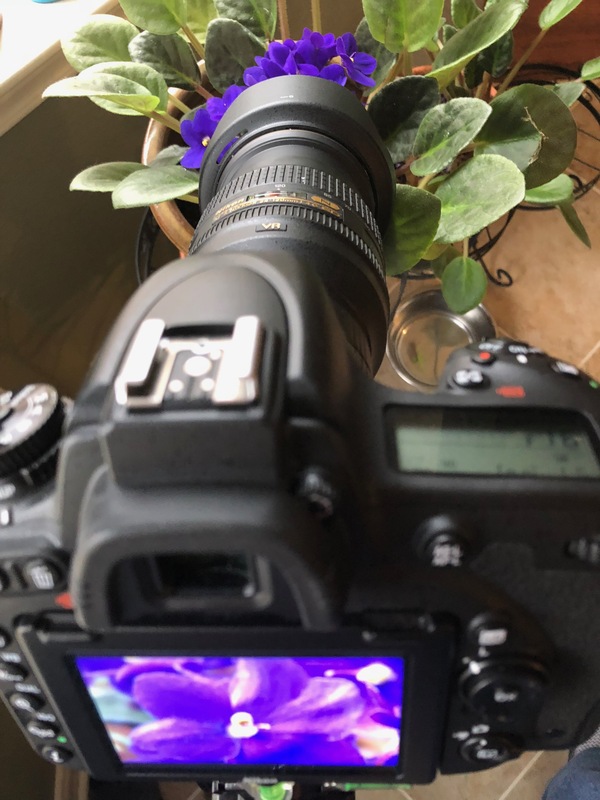 One of the challenges of shooting with extension tubes is the reduced light reaching your sensor as the effective aperture is reduced, so you have to take longer exposures or bump up the ISO. And as you are right up against the object, any tiny movement shows up as motion blur. I mounted my camera to a tripod, used a remote shutter release, and set the remote to first raise the mirror so that I could delay the shutter until the mirror vibrations calmed down. I also used live-view and zoom to manually focus on my target. With an extension tube, the depth-of-field goes down to almost nothing, even stopped down to a narrow aperture. So you may only get a thin slice of the subject in focus. My procedure was to position the camera, adjust the zoom, wait for things to be still, manually focus, raise the mirror with the first remote button press, wait a couple of seconds and then release the shutter. The below picture is a close-up taken at 120mm focal length and f/16. There was so little light that this is a 20 second exposure. 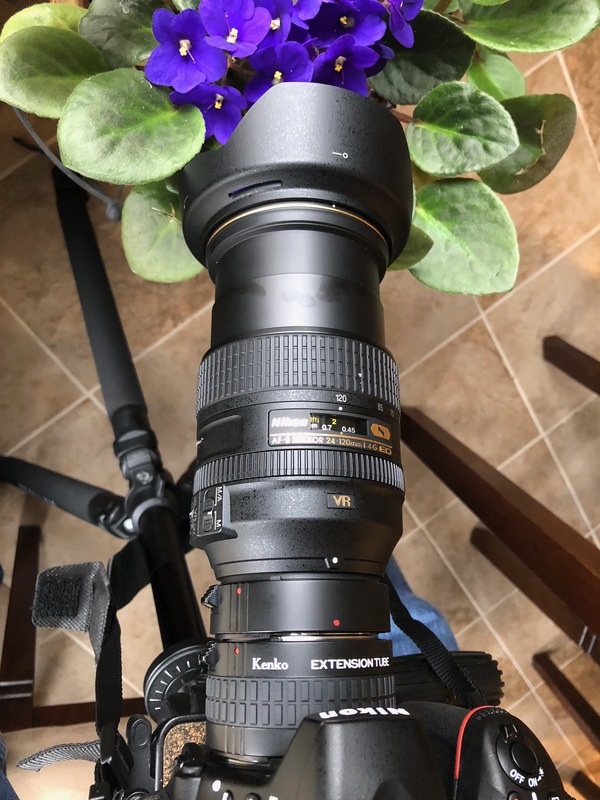 The front of the lens is almost right on the flower. With the next pictures, I backed off to try to get an entire flower in focus. These pictures were taken at 55mm and are 20 – 25 second exposures. I tried removing the lens hood on the last shot and ended up with some lens flair. The lens hood made live view focusing a bit difficult with the low amount of light, so I used a flash light to help set the focus. So, extension tubes are fun to play around with. I have had these for a while. They aren’t nearly as good as a real dedicated macro-lens for doing a lot of close-ups, but macro-lenses are more expensive. All the technical details it takes to produce an expert photograph leave me in awe. Your talent and knowledge is obvious. 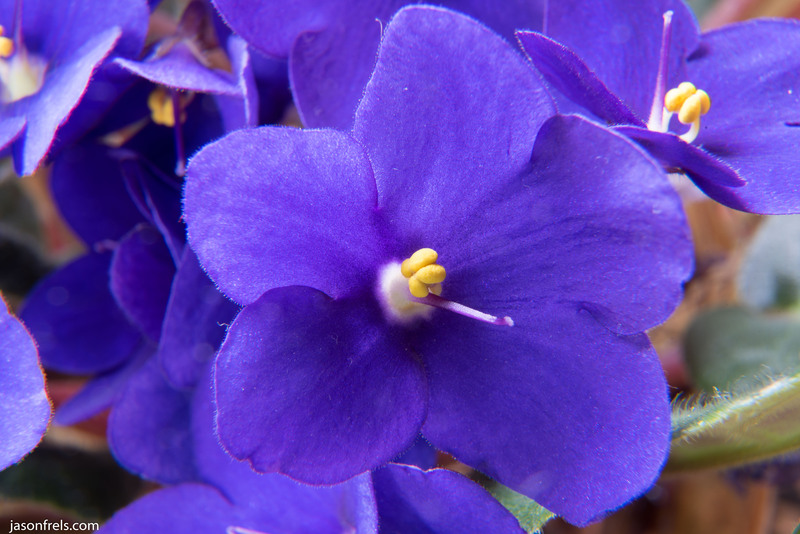 Great images, I love the purple colour of the petals. 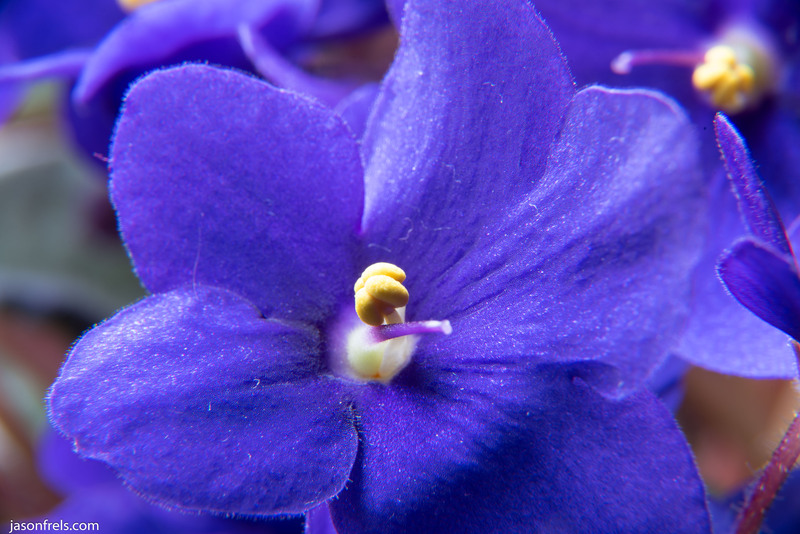 Did you try any focus stacking with the extension tubes? Focus stacking would have been a neat idea; I didn’t think of it.